Want to give her a special date this Valentine? Skip the flowers and forget the chocolates, treat her to a well thought-out evening of pampering that would spoil her heart out. 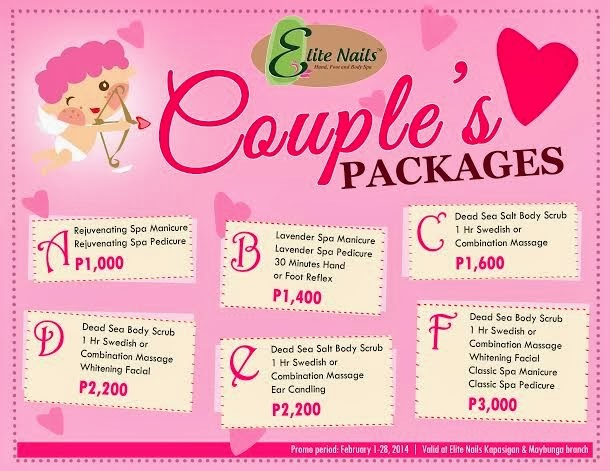 Simply spend the day with her and enjoy luxurious time together relaxing , give her the care that money can’t buy; At Elite Nails & Spa. We have Couples Packages that you would both adore. Have a Rejuvenating Spa manicure and pedicure together or a Lavender Spa Mani-Pedi with Foot Reflex, or go the whole nine yards with our Dead Sea Body Scrub with Combination Massage and Whitening Facial. There are several packages to choose from that should please her, and you too will appreciate. It would be a day of relaxing romance, or a beginning of a romantic evening ahead. She will be delighted to share with you these indulgences she usually shares only with her girl-friends. The best Valentine date ever, savor the moment of feeling loved and cared for together and this shall mark the bloom of renewing romance.